The White Horse by John Constable (1776–1837) is a full-size oil sketch of one of the artist's first large-scale landscape paintings. The final version, now part of the Frick Collection in New York, was first exhibited in 1819 at the Royal Academy and was the beginning of a series of works that became famously known as the "six-footers" for their grand size. The scene is a view from the south bank of the River Stour in the countryside around Suffolk, England, where the artist was born. The barge in the lower left corner is carrying a horse from the towpath on the near side of the river to the opposite bank. Hidden beneath this painting is a version of another Constable painting, Dedham Vale from the Coombs. The artist reused the canvas and painted over the scene to create the The White Horse sketch. The painting that is visible today was once obscured by paint added by someone other than Constable over a century ago, perhaps in an effort to make it look more finished. Through microscopic examinations, x-radiography, and painstaking analysis, expert conservators and scholars were able to decipher the multiple layers of paint on the canvas. The work was cleaned over a period of several years, from 1992 to 1997, and the lively and well-preserved Constable sketch was revealed. Almost certainly retained in the studio by the artist until his death in 1837. John (later Sir John) Pender [b. 1816], by 1872. (E. Fox White Gallery, London), by 1882; sold to (Wallis & Son, London); purchased 1893 by Peter A.B. Widener, Philadelphia, and Lynnewood Hall, Elkins Park, Pennsylvania; inheritance from Estate of Peter A.B. Widener by gift through power of appointment of Joseph E. Widener, Elkins Park; gift 1942 to NGA. The Gallery's painting is the first of the artist's full-scale sketches for his six-foot canal scenes. The finished painting based on this sketch is now in The Frick Collection, New York. Pender lent the painting to the 1872 Winter Exhibition at the Royal Academy of Arts in London, Works of the Old Masters, together with Works of Deceased Masters of the British School. See the letter from Wallis & Son to P.A.B. Widener, 1 January 1909, in NGA curatorial files. Works of the Old Masters, together with Works of Deceased Masters of the British School. Winter Exhibition, Royal Academy of Arts, London, 1872, no. 118. 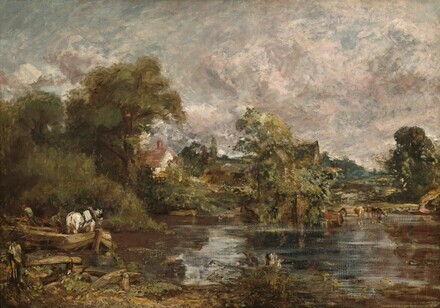 Constable's Great Landscapes: The Six-foot Paintings, Tate Britain, London; National Gallery of Art, Washington, D.C.; The Huntington Library, Art Collections, and Botanical Gardens, San Marino, 2006-2007, no. 28, repro. twice. The ground is white lead and chalk. There is a tan-colored imprimatura. near the top edge, corresponding to the bottom edge of the top stretcher member. Smetham, Sarah and William Davies, eds. Letters of James Smetham. 2d ed. London and New York, 1892: 289-291. Roberts, William. Pictures in the Collection of P.A.B. Widener at Lynnewood Hall, Elkins Park, Pennsylvania: British and Modern French Schools, Philadelphia, 1915: unpaginated, repro. Paintings in the Collection of Joseph Widener at Lynnewood Hall. Intro. by Wilhelm R. Valentiner. Elkins Park, Pennsylvania, 1923: unpaginated, repro. Paintings in the Collection of Joseph Widener at Lynnewood Hall. Intro. by Wilhelm R. Valentiner. Elkins Park, Pennsylvania, 1931: 170, repro. Paintings and Sculpture from the Widener Collection. National Gallery of Art, Washington, 1948 (reprinted 1959): 95, repro. Reynolds, Graham. Catalogue of the Constable Collection in the Victoria and Albert Museum. London, 1960: 27. Walker, John. National Gallery of Art, Washington, D.C. New York, 1963 (reprinted 1964 in French, German, and Spanish): 321, repro. Reynolds, Graham. Constable: The Natural Painter. London, 1965: 63. Summary Catalogue of European Paintings and Sculpture. National Gallery of Art, Washington, 1965: 29. European Paintings and Sculpture, Illustrations. National Gallery of Art, Washington, 1968: 22, repro. European Paintings: An Illustrated Summary Catalogue. National Gallery of Art, Washington, 1975: 72, repro. Walker, John. National Gallery of Art, Washington. New York, 1975: no. 594, color repro. Hoozee, Robert. L'opera completa di Constable. Milan, 1979: 149, repro., no. 618. Rosenthal, Michael. Constable: The Painter and His Landscape. New Haven and London, 1983: 117, pl. 152. Reynolds, Graham. The Later Paintings and Drawings of John Constable. 2 vols. New Haven and London, 1984: 1:27-31, no. 19.2; 2:color pl. 69. Walker, John. National Gallery of Art, Washington. Rev. ed. New York, 1984: 408, no. 579, color repro. European Paintings: An Illustrated Catalogue. National Gallery of Art, Washington, 1985: 93, repro. Rhyne, Charles S. "Constable's First Two Six-foot Landscapes." Studies in the History of Art 24 (1990): 109-129. Hayes, John. British Paintings of the Sixteenth through Nineteenth Centuries. The Collections of the National Gallery of Art Systematic Catalogue. Washington, D.C., 1992: 32-39, repro. 35. Kirsh, Andrea, and Rustin S. Levenson. Seeing Through Paintings: Physical Examination in Art Historical Studies. Materials and Meaning in the Fine Arts 1. New Haven, 2000: 200-202, 279, color figs. 217-219. Kelly, Franklin. "John Constable, The White Horse." and Swicklik, Michael. "Uncovering Constable's Lost Sketch for The White Horse." Bulletin / National Gallery of Art, no. 35, (Fall 2006): 2-7, figs. 1 and 2; 8-11, figs. 1-6. Gariff, David, Eric Denker, and Dennis P. Weller. The World's Most Influential Painters and the Artists They Inspired. Hauppauge, NY, 2009: 99, color repro.